What the story's about: This story is all action! In keeping with our other webcomics & short stories, this should be about 4 or 5 pages long (maybe 6). The whole thing just shows Mortem Brand wiping out a legion of Bones (skeletons). Unlike other zombies, bones use weapons and are trying to KILL Mortem Brand (not eat him). The bones are more intelligent in combat than zombies, but lack any team-like coordination. 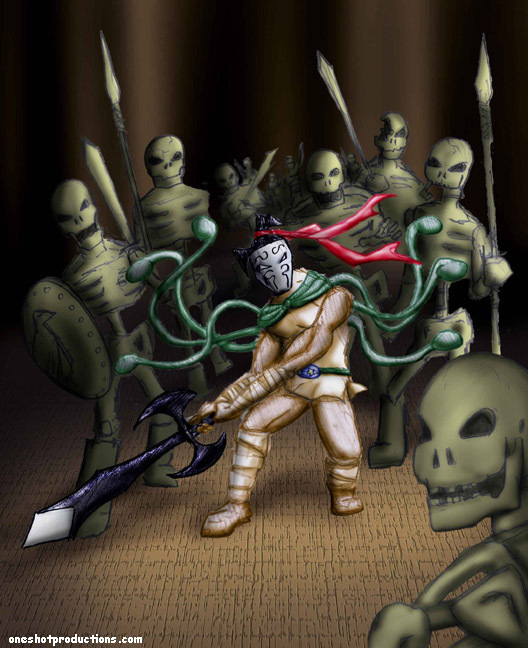 The bones are each outfitted with weapons such as swords, spears, and some have shields. In my drawing, I've got the bones wearing tall boots (the boots are optional). Mortem Brand has a variety of tricks he uses in addition to his enchanted sword. His cape can take the shape of tendrils (as pictured), which can be used to wrap around enemies' arms & weapons defensively. He also wears a belt that can teleport the Mortem Brand short distances. Unlike our other stories, this one isn't scripted out for you. Do whatever you want! Obviously, Mortem Brand can't lose the fight, but be creative with it. The Bones can attack however you like. Mortem Brand would likely make all his kills with his own sword, but maybe he chops each of his attackers differently. And here's an important note: No one else can pick up the Mortem Brand's sword (or it burns their hand). The more skeletons, the better! Good luck! -More information about the Mortem Brand.